TBIRF has a long and productive history of performing spine research in the areas of clinical outcome studies, diagnostic studies, and other areas. This work has been shared through publication in medical journals and presentations at national and international conferences (click here for a list of these activities). The first studies conducted at TBIRF were multicenter investigations on lumbar CT/discography. This work developed the Dallas Discogram Description which was a scoring system for the CT/discographic images and the pain provocation portion of the evaluation. This work refined and provided standardization of interpretation of this test for diagnosing discogenic low back pain. 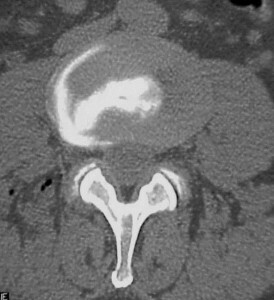 CT/Discogram showing lateral fissure and protrusion with a circumferential lesion. The patient’s clinical symptoms were reproduced upon injection of the disc. TBIRF has been very active in research related to lumbar and cervical total disc replacement (TDR) and helped to bring this technology to the US from Europe. Since 2000, with the first lumbar TDR implantation in the US as part of an FDA trial conducted at TBI, the Foundation has worked with surgeons in evaluating and reporting the results of this technology. This research has been the basis for many presentations at national and international conferences and also publications in the peer-reviewed literature. The research in this area is ongoing to include longer follow-up. The overall findings of this work are that TDR is a viable alternative to fusion in both the lumbar and cervical spinal regions and the re-operations rate is lower with TDR than fusion. TBIRF has been involved in research investigating factors related to clinical outcome from surgery. This research has included findings of the impact on non-spine medical problems on the results of surgery. Working with Dr. Andrew Block of the Texas Back Institute, research has been performed to address the impact of personality factors on the experience of back pain and treatment outcome. His work has resulted in the development of a pre-surgical psychosocial screening instrument that can help identify patients who may be at risk of a less favorable treatment outcome. TBIRF is involved in collaborative projects on the development and use of registries for outcome assessments for spine treatments. These projects are in the developmental stages with the goal of creating large scale, national and international registries to evaluate operative and non-operative interventions. Such registries have great potential such as large numbers of patients and standardization in data collected – particularly important to have all participants using the same patient questionnaires. 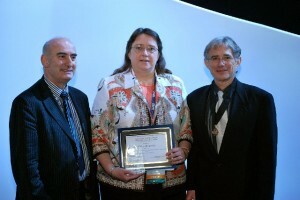 Dr. Donna Ohnmeiss of TBIRF accepts the best overall paper award at the 2012 International Society for the Advancement of Spine Surgery (ISASS) annual conference in Barcelona. Blumenthal SL, Ohnmeiss DD, Guyer RD, Zigler JE: Re-operations in Cervical Total Disc Replacement Compared with Anterior Cervical Fusion: Results Compiled from Multiple Prospective FDA IDE Trials Conducted at a Single Site. Spine 38(14):1177–1182, 2013. Summary of results: The article compared re-operation rates of patients enrolled at TBI in multiple FDA-regulated trials comparing cervical total disc replacement (TDR) to anterior cervical fusion (ACF). The results found that the re-operation rate was significantly lower among patients randomized to receive TDR than among those undergoing fusion. At the 2013 North American Spine Society (NASS) conference in New Orleans, TBIRF was involved with a symposium, Data Collection, Value and Cost-Effectiveness of Spine Care. Dr. Ohnmeiss presented on the importance of using validated clinical outcome measures and the problems created by not doing so. It is hoped that the presentation will increase the awareness of the importance of standardization in data collection. During the same symposium, Dr. Guyer described the implementation of a surgical case peer-review and surgical quality assurance programs implemented in the clinic. This is a unique program and it is hoped that other clinics will use it as a model to implement similar programs targeted toward continual focus on quality care. combining cervical disc replacement at one level with fusion at the adjacent level. This procedure is an alternative for patients with symptoms arising from 2 or more disc levels in the neck and who have not achieved adequate relief from non-operative treatment. Results are based on chart review and mailing questionnaires to patients to determine their current condition. Assessments used will include neck and arm pain, Neck Disability Index scores, and re-operations. For many years, one of the most common techniques of fusing the cervical spine has involved the use of a graft material, perhaps used with a cage, and an anterior cervical plate. The design of newer implants obviates the need for the anterior plate. The purpose of this study is to review records to determine the effectiveness of this option. Results are based on chart review and mailing questionnaires to patients to determine their current condition. Data collected will in include neck and arm pain, Neck Disability Index scores, and re-operations. You are vital to research! Whether you sign up for a study, or complete questionnaires in the office or received in the mail, you are providing us with very important information. Only with your input can we determine how well patients do after a particular treatment. Once the information from a group of patients is received and analyzed, a summary of the findings is shared with care providers nationally and internationally. In this way, you are having an impact on the care of many patients. It can also help future patients with a problem similar to yours, know what to expect following care, helping them make better treatment decisions, and what questions to ask. Someday, you may receive a letter from us asking to you to please complete a questionnaire or to answer questions over the phone. We understand that it may be bothersome to complete and return the form. However, it is only from your input that we can learn how patients are doing. This is critical to determine outcome, refine indications, and share what to expect with future patients. Such mailings are reviewed by an independent Institutional Review Board to help make sure that the questionnaire is reasonable and that adequate safeguards are being taken to protect your information. We never release any individual information. And of course, if you ever have questions about such a letter, always feel free to contact the person whose name is provided. To patients who take to time to complete questionnaires: THANK YOU! We cannot do our research work without your input.